Traveling is an incredibly rewarding experience. It changes your perspective on the world, on life, on yourself. It's exciting and, once you've booked, all that's on your mind is leaving home. But while travelling is a largely positive experience, things can go wrong. You're stepping into the world of the unknown, and with that comes an element of danger. Whether you break your arm trekking, or have your camera stolen while enjoying a drink with friends in a bar, you need to protect yourself with reliable travel insurance. I've travelled for over 11 years now, mostly throughout SE Asia. I've seen everything from motorbike accidents in Chiang Mai to baggage lost in Luang Prabang and travelers cheques stolen in Vietnam. I've met numerous travelers whose plans were ruined because they didn't have adequate insurance. I don't want that to be you. So to help you fully protect your travel plans, I'm going to tell you what you should look for in a long stay/backpacker insurance plan, and give you the low-down on what I think are the two best travel insurance companies. The temptation is to just go with the cheapest quote and think, “That'll do”. After all, the odds of something bad happening are pretty slim. But why risk your health and belongings during the trip of a life time? Peace of mind is everything when it comes to travel. These moments will be moments to remember. Of course, sufficient medical and personal accident cover are givens, but also consider what else you might need. For example: I always travel with an expensive Macbook. You, on the other hand, might have an expensive camera to document your travels. Even what you might consider “travel basics”, like good hiking gear, could be cause for an untimely end to an adventure if it gets stolen or damaged. Another key policy point to look for is whether or not the insurance company requires a return date. Not having a return flight date invalidates most policies. This is because the majority of insurance companies create policies aimed at short-term holiday-makers with a set return date. But you might not want to book a return date , as most travelers to South East Asia and beyond are adventurers looking for more than two weeks on one beach. In addition, perhaps you have a return date in mind but might want to extend your trip and take out another policy while travelling. Again, the problem is that the majority of companies do not insure people who are already travelling. So with all this in mind, you need a travel insurance company that understands the flexible needs of backpackers and long-stay travellers. I’m going to walk you through my two top company recommendations, both of which cater for backpackers, long-stay and standard holiday travel, and both of which I have personally used through the years. Note that the quotes below are in British Pounds (GBP) because that's my home country. To get a quote in your home country's currency, click through to the website (links are below). First up is True Traveller. True Traveller covers every country in Europe. If you are from the US, Canada, Australia or other, skip to my second recommendation below. This company has streamlined its process over the years and keeps things really transparent and simple to understand. The website experience is super user-friendly, and they offer live chat on the quote page – so you can jump on there with any queries you might have mid-quote. True Traveller offers three policy types, with the ‘Traveller' option the most popular. The excess for each policy is 125, 75, 35, respectively. Now, here's what the prices look like with the excess at zero. Medical cover on the ‘Traveller' and ‘Plus' packages is more than adequate, as is personal liability. You can exclude the baggage cover to make the quote even cheaper, but I always keep that in as I think it's an important inclusion for any trip. There is an additional option for trip delay coverage. You also have a choice of 3 activity packs to include in your policy. The ‘Traveller Pack', which covers 91 activities, is included as standard, but if you're doing outdoor pursuit courses you might need the ‘Adventure Pack', or if you're flying an airplane, you'll need the ‘Extreme Pack'! Winter sports is an optional extra too. Website tip: Hover over the ? sign to see all included activities in a given package. I'm sure you'll agree that this is great value. £137.57 ($181) on the ‘Traveller Plan'. That works out at £1.52 ($2.00) a day! Even with the ‘Extreme Pack' included, which most people won't need, the ‘Traveller Plan' comes in under £168 ($221). They pay out. Period. Have a look at this testimonial sent to me by a TTL reader (cheers Achim). I was unfortunately hospitalised in Nepal with an undiagnosed tropical disease and TT paid out for everything I required at the time including hospital costs as an inpatient for eight days and hospital fees as an outpatient for three weeks after, enabling me to continue my trip. This is an eventuality I hadn't considered. This chap came down with an unidentified tropical disease, and True Traveller paid for all the care so he could continue his trip. 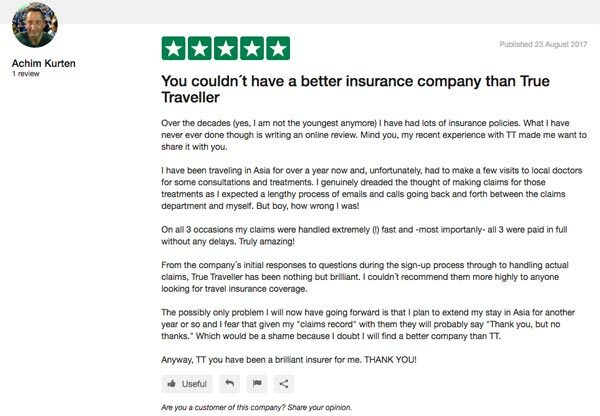 There would be nothing more upsetting than having to pull out of a great adventure due to illness, and this story shows True Traveller go above and beyond with their customer service. An alternative for those seeking a tad more customisation to their insurance policy comes from World Nomads. World Nomads provide cover for everything from a basic trip to an adventure holiday and travel that has very specific requirements. Like True Traveller, they are also very competitively priced, and also serve the UK, Europe, US, Canada, Australia and pretty much every other country. The quote seen below is based on the same trip requirements, 3 months in Thailand for a 39-year-old male. Note that generally, the older you get, the more travel insurance goes up. But to be fair, in 11 years, for me, with both these companies, it's only gone up around £10. The quote in this example is with £75 ($99) excess. If you're wondering what those quotes are in $USD: Standard is $172, and Explorer is $215. When compared with the True Traveller ‘Traveller Plan' (with excess), TT is cheaper by £15 ($19) on the ‘Standard Plan' and by £20 ($26) on the ‘Explorer Plan'. You always want to aim for as little excess as possible. Zero sounds good to me! You can't really compare the two companies exactly side by side though, because the World Nomad's ‘Standard Plan' falls somewhere between the ‘Value' and ‘Traveller Plans' of True Traveller. However, the ‘Plus Plan' and ‘Explorer Plan' are fairly comparable, and with excess turned on for True Traveller, the difference is about £20 cheaper between the two plans. That said, you do get Trip Interruption cover as standard on the World Nomads ‘Explorer Plan', which might be worth the extra £20 to you. However, you then need to consider whether you require any additional cover such as Winter Sports, Hiking, or cover for high-value electronic items. Once you have made a choice between ‘Standard' and ‘Explorer', you will be taken to a page where you can select what activities you expect to be engaged in, and the electronic items you are taking on your trip. The search engine will tell you whether these things are covered in the policy, or whether you will have to pay extra. 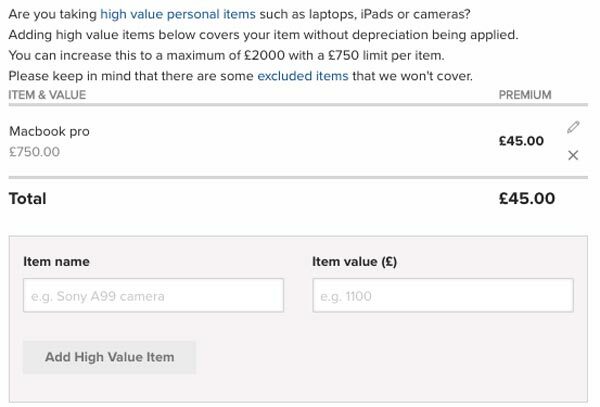 In the example below, I added my MacBook Pro at the maximum value of £750($989). This put the policy up by £45 ($59) . But the good news is that World Nomads guarantees that price (if I lose my Mac) with no depreciation. Impressive. If I lose my Mac, or have it stolen, they pay me £750 towards a new one. I do like a kick about with a football, and in the past I have done white water rafting and high altitude trekking. So I always need to make sure I'm covered if I pull one too many silky skills showing the locals how to play ball, or if I fall and sprain my knee somewhere along the foothills of the Himalayas. 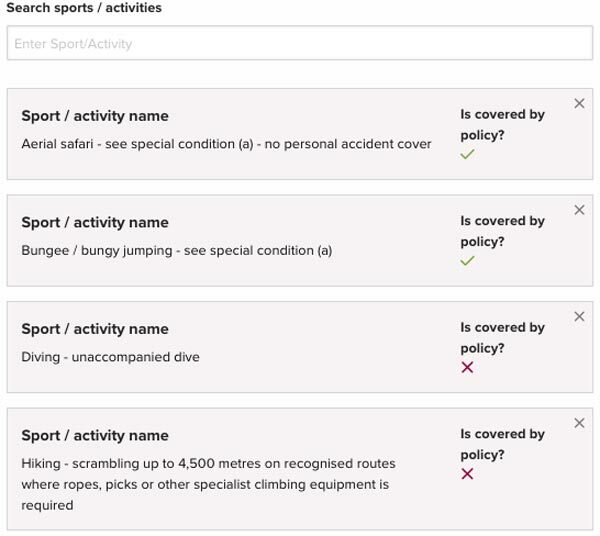 As you can see, bungee jumping is covered but unaccompanied diving isn't, nor is hiking 4,500 metres up a mountain. I should also note that included in every WN policy is a small donation to a local charitable that seeks to change the lives of the disadvantaged. We all love travelling to exotic places, and to be able to so easily give something back to the communities we visit is a really cool and necessary thing. So you had a fall and sprained your wrist. Luckily, you will be insured. But will they pay out? It's all well and good a policy being competitively priced, but what you really want to know is whether the company will cover you in the event of a claim. Like True Traveller, WN has a very good reputation when it comes to claims. I fell off a roof in Argentina and shattered my arm. Waking up in a local hospital after an operation was terrifying and World Nomads immediate help saved my arm, perhaps my life and got me home. I can’t imagine navigating that experience without World Nomads. Both companies have a 24-hour emergency service number on the policy document, which you should ring as soon as possible if admitted to hospital. If you're unlucky enough not to be able to call yourself, the hospital can do this for you, or a friend. Important note: You don't pay the hospital directly for a major incident like this. You will be liable for the excess stated on your insurance policy, but the hospital is dealt with and paid by the company, not you. For more ordinary cases — think a bout of flu or food poisoning, or material stuff like repairs to your camera or adventure gear — report the issue to the insurance company as quickly as possible. You will then pay upfront and keep hold of your receipts. You will then submit your claim and send off the receipts (usually when home) and they will reimburse you. So, Which Company Should You Choose? Sure, True Traveller is probably cheaper on a standard trip to Thailand for anywhere between 14-90 days, but if you have additional requirements or want the highest possible cover for medical, personal liability, baggage, cancellations, etc., then get a quote from both, as the prices will differ depending on your package. And if you're reading this and panicking because you've already left home and forgotten to get insurance, or because you decided that going home sucked and you've opted to travel for longer, you're in luck. A final word: Don't skimp on insurance cover. We've all read the stories of foreigners without travel insurance having terrible accidents in Thailand (usually on a motorbike). They find themselves stuck in a government hospital, wrack up a massive bill that they can't pay and have to start a fund raising page to get home. I hear mixed stories on the need for insurance in Thailand. Some say medical care is so inexpensive that better to self insure (which I guess is another way of paying out of savings). Here in the US medical care is so unbelievably expensive - even a couple of days in a hospital can cost a fortune. Short of heart surgery can medical care in Thailand be that expensive? Hi Daniel,It really depends on your requirements. 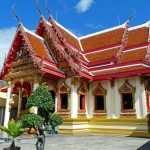 If you are on a short or long stay holiday, or you stay in Thailand for the majority of the year but always return home once or twice a year, then travel insurance that covers long trips of more than hundred 180 days will probably suffice.However, if you are an expat who rarely returns home, then you will need medical insurance. You can get local medical insurance from a company like BUPA Thailand, for example. 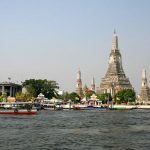 For around 5 to 20,000 Baht per month - depending on your age and any pre-existing conditions - you can get good cover that will enable you to access private hospitals.That said, some people want medical insurance that will cover them in Thailand, in other countries that they may visit on holiday, and cover them when they visit back home. It really depends On your requirements and your budget.If you want a rough idea of what proper medical insurance cover will cost you, fill out this quote generator here: It takes 2 minutes. Try finding insurance if you are over 65 and you only bought a one way ticket. The travel insurance business is a racket and you are better off self-insuring and just foregoing it. Yes, True Traveller does insure over 60's but doesn't cover the US. Hello. Many thanks for your useful advice on many topics. In the "bad" old days I used to travel without fixed itinerary, just went as it suited me. However, nowadays I can't find a travel insurance offering this kind of freedom. They always ask for the fixed days of start and return with the air tickets booked accordingly. Do you know any insurance company being more liberal in this regard? Thank you. The majority of insurance companies require you to have a return or open ticket booked to take out a policy. Most people don't read the terms and conditions and take out the policy without the return ticket, which invalidates the policy.Both my recommendations do not require your return ticket to be pre-booked or booked to take out a policy. This is a primary reason I began using these companies, because I often just book one way. Another reason is that they will insure me while I'm travelling, should I extend my trip. Just enter your proposed start and return dates. I am wondering what insurance company you recommend for foreigners resident in Thailand? The policy should include, say, 60 days travel in Asia. You can try World Nomads. I just ran a quote for 40 days travel in Asia for a male under 66 years old and it came back at $184. You can select that you are a resident in Thailand. Thanks so much for this! Would you still recommend this if the trip is only 2 weeks? Will be traveling (alone) from Bangkok to Chiang Rai to Chiang Mai to Krabi. Yes, these recommendations are good for both short and long term trips. I extended my insurance while traveling by taking out a one week policy, just to give me some more time. No worries Anders, thanks for reading. Looks like True Traveller doesn't cover US Citizens. That's correct, they cover Europe. Try World Nomads instead. They are really good. I want to get travel insurance for my Thai girlfriend to visit UK. Any recommendations? So happy to have across this. I tossing up now between TT and WN, there's not much in the quotes so it's down to preference really. I don't have a return flight date and I'll be doing trekking and diving. I also just bought a new MAC so I want to make sure all this is covered. Thanks for your tips. I'll be back to read your blog when I hit Thailand in March. Glad it helped you out Lesley. I'm with TT at the moment but my policy is up soon so I'll be comparing again!